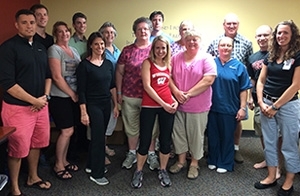 Participants, faculty and staff from the Verona Clinic 2020 Fitness and Lifestyle Challenge, a pilot program that helps patients develop healthy lifestyles. A community health initiative recently piloted at the UW Health Verona Clinic has helped patients there eat better, exercise more, and live healthier lives. Launched in February and completed in mid July, the 20-week Verona Clinic 2020 Fitness and Lifestyle Challenge was aimed at clinic patients who have a body mass index (BMI) of 30 or greater. Approximately 20 patients participated in the pilot. The DFM’s Brian Arndt, MD, Maggie Larson, DO, and Julia Yates, MSSW, led the program, which was supported by a grant from the Health Resources and Services Administration (HRSA). Rounding out the team were DFM residents Thomas Hahn, MD, and Vincent Minichiello, MD; chef Ryan Yates; and yoga instructor Jo Temte. The team led monthly group visits in which they checked patients’ weight and vital signs; taught them about nutrition, meal planning, and food preparation; and led guided yoga and relaxation exercises. They encouraged patients to set small, achievable exercise and nutrition goals each week, and sent weekly motivational emails with recipe ideas, grocery lists and fitness tips. In addition, they provided pedometers and suggestions for mobile apps that could help support patients as they work toward their goals. To help patients make healthier choices in the community, the team also partnered with local businesses to offer discounts on groceries, takeout food and fitness centers. They even accompanied patients to a local gym and introduced them to the facilities and coaches there. Patients who attended at least five of the six group visits, ate at least two healthy meals per week, and exercised twice a week also received a $100 incentive from participating insurance providers. Participants noted many positive aspects of the program. “The healthy food prepared by our chef was delicious,” said one. “The weekly recipes added some new life and variety to our dinner menus!” said another. Fortunately, the group setting helped participants encourage one another to meet goals and overcome challenges. The group setting also benefited the clinical team, who got valuable feedback on ways they could help motivate patients to improve diet and exercise habits—tips they can use with other patients. “This project is a great experience and an opportunity for me to share my personal conviction of the importance of holistic health,” said Ryan Yates, the team’s chef, who is also training to be an occupational therapist and clinical exercise physiologist.